Interview Entretien avec Andrei Tarkovski (sur "Stalker") with Aldo Tassone in "Positif", Oct. 1981 (247) pp. 2326. Pol. trans. Zygmunt Kwiatkowski. Stalker does not enter the Room, that wouldn't be proper, that is not his role. It would be against his principles. Also, if all this is indeed a fruit of his imagination then he does not enter because he knows no wishes are going to be granted there. For him it is important that the other two believe in the Room's power and that they go inside. Stalker has a need to find people who believe in something in the world in which no one believes in anything. Why doesn't Writer enter the Room? This is something we don't know and neither does he. Nor where he is going and what he is searching for. We know Writer is without a doubt a talented man but he is already burnt out. He currently writes what is demanded of him, what critics, publishers, readers expect from him. In fact he is a popular writer. But he does not want to prolong this situation. In the first part of the film he seems to think that after entering the Room he would perhaps write better, he would again become himself and he would find relief from the burden he is carrying within himself. Later his thinking changes: if I change, if I become a genius, then why should I continue writing, as everything I'll write is always going to be perfect? The goal of writing is to overcome oneself, direct others towards the goal and the path to its realisation. What should a man who is a genius a priori write for? What can he offer? Creation is an expression of will. If a creator is a genius a priori, his creation loses all significance. Besides, Writer thinks about the story of Porcupine who hanged himself. He deduces from it that what is granted in the Room are not wishes but a kind of internal vision hidden within human heart. Perhaps they are true wishes pertaining to the inner world. If, let's say, I wish to become rich then I'll probably obtain not the riches but something more compatible with my nature, depth, the truth of my soul — for example poverty — which is closer to what my soul needs in fact. Writer is afraid to enter the Room because his opinion about himself is rather unflattering. And regarding the scientist, he has absolutely no intent to enter. He is after all carrying a bomb, he wants to blow everything up. For him the Room is a place that could be visited by those whose wishes might endanger entire human life on Earth. Yet Professor gives up his plan as it is silly to be afraid people would wish for unlimited power in the Room. They usually desire really primitive things: money, prestige, women... That's why Professor does not destroy the Room. Another reason is that it's necessary to preserve a place for people to come to preserve hope, express longing, fulfil the need for the ideal. 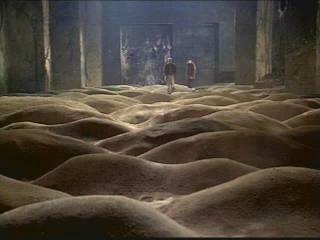 At the end of the film Stalker laments over baseness of those who did not enter the Room, he considers their attitudes. They didn't enter on account of their cowardice. Writer is more afraid than most. He has a highly developed sense of his own worthlessness but at the same time he says to himself: why enter if nothing special happens there and most likely no wishes are granted? On the one hand he understands that wishes cannot be fulfilled and that they won't be fulfilled. And on the other, above all, he is afraid to enter. His approach is full of superstitions and contradictions. That's why Stalker is so depressed — nobody really believes in Room's existence. Writer completely questions it. He says: "It probably doesn't exist" and he asks Professor: "Who told you this Room even existed?" The scientist points to Stalker. So he appears to be the sole witness. He is the only person who can testify to the existence of a Room with the power to grant wishes. He is the only one who believes. All the stories about the Room come from him — one could imagine he has invented it all. For Stalker the worst thing is not that his clients were afraid but that they did not believe, that there was no room for faith anymore. Man devoid of faith has no spiritual roots, he is blind. Over the centuries different concepts were associated with faith. In these days of no faith it is important for Stalker to light up a spark within human hearts. The Zone is in some sense a result of Stalker's imagination. Our line of reasoning was as follows: it is he who invented that place to bring people there and convince them about the truth of his creation [...] I completely agree with the suggestion that it was Stalker who had created the Zone's world in order to invent some sort of faith, a faith in that world's existence. It was a working hypothesis which we tried to preserve during creation of that world. We even planned an ending variant in which the viewer would find out Stalker had invented it all and now he is heartbroken because people do not believe him. Stalker is not a desperate film. I don't think a work of art can be inspired by this sort of feeling. Its meaning must be spiritual, positive, it should bring hope and belief. I don't think my film lacks hope. If this is true — it is not a work of art. Even if Stalker has moments of despair, he masters them. It is a kind of catharsis. It's a tragedy but tragedy is not hopeless. This history of destruction still gives the viewer a glimmer of hope. It has to do with the feeling of catharsis. Tragedy cleanses man. Every image, even the most expressive one (and this is precisely what it ought to be) possesses a very significant and very distinct intellectual content. I like Stalker the most. The is the best part of myself and at the same time the least real one. Writer — who is very close to me — is a man who has lost his way. But I think he will be able to resolve his situation in the spiritual sense. Professor... I don't know. This is a very limited character and I wouldn't want to seek any similarities between him and myself. Although despite the obvious limitations he does allow a change of opinion, he has an open, comprehending mind.